Among others is to offer developers integration with the Generic Graphics Library (GEGL) to allow non-destructive editing of HDR and RAW graphics that are rendered in up to 32-bit color depth per channel. The GIMP user interface was also integrated with conventional graphics programs by moving the toolbox menu bar into the main window. Gleaned from an interview with GIMP developer Simon Budig, the advancement from 16-bit to 32-bit floating point occurred in small steps. GIMP 2.6 provides higher color depths, albeit through a toggle in the Colors menu to switch to the GEGL library (the default is still 8 bits per color channel). GEGL also allows image edits above and beyond RAM buffer capacity without compromising graphics quality. While High Dynamic Range Imaging (HDRI) is still the norm in digital imagery and game technology, the raw image format of RAW files is a different story: most digital SLR cameras now render pictures in RAW format over a dynamic range of 12-bit to 16-bit color channels. Even seasoned users of the GIMP user interface will not have a problem adapting to its new look. New users who might have previously eschewed the interface will also not be disappointed. GIMP 2.6, like other graphics programs, now displays an initial empty image window. This work area integrates the menus from the previous toolbox and allows for drag-and-drop. The Toolbox and Docks menu placement in the main window allows for better window management in that the tools are no longer lost in the background. A qualitative enhancement is GIMP 2.6's use of the Cairo 2D graphics library, as shown in this comparison. The proof is in the details: the brush can be positioned much more accurately on the edge of an image. The freehand select tool supports polygonal selections and allows mixing freehand with polygonal segments. Brush input dynamics allow mapping of size and opacity to produce velocity-dependent painting, such that a quicker mouse movement will draw a thinner line. A check box in the Paint Tool option allows for true brush-stroke emulation for variability along a brush stroke depending on pressure and velocity. 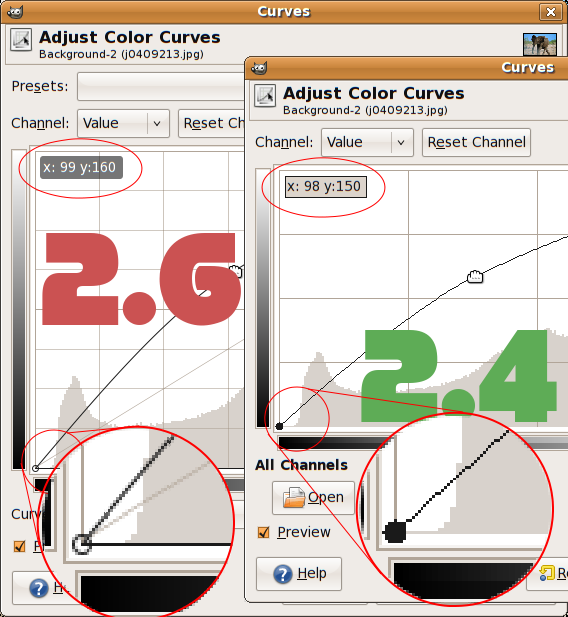 The GIMP developers are planning changes to the Text Tool in version 2.8. Meanwhile the current changes are described in the GIMP 2.6 release notes. The source code for evaluation is available as tarballs from the downloads website. If you are willing to wait, you can install the newest version from the usual package manager of the distribution when it is ready. The main interface became worser. The developers removed the toolbox menu, and instead of that there are some ornamental symbols - probably nice, but useless. And there is an always open extra window, which you cannot close, because closes the application. When you just want to create a logo or take a screenshot, or just want to drag and drop an image from the desktop, this brainless window is always in the way.